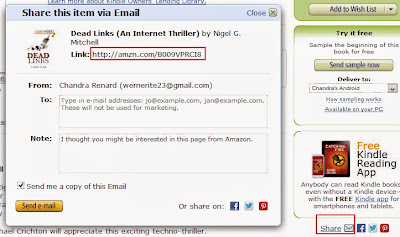 Do you need to promote your Amazon Kindle ebooks? One of the problems with promoting books on Amazon is getting the URL for the sale page. If you just go to the website URL, it's huge and full of random numbers. Not good for sharing. If you want to send it on Twitter, it's even worse. There are services that will shorten URLs like ow.ly, but it's kind of tedious to have to go to those websites and enter in the info, etc. Fortunately, I discovered that Amazon has its own domain-shortening service (amzn) that's not well promoted, but works great. There are two ways to get your amzn short link. 1. 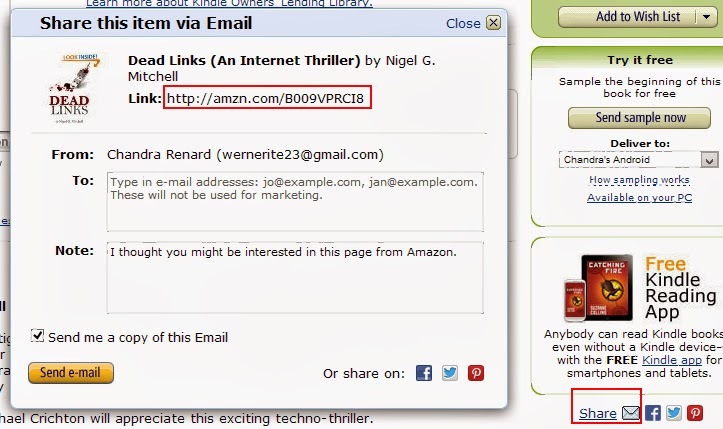 The first way involves going to the page for your Amazon book, and looking on the right hand side for the sharing options. Click "share by email," and copy and paste the URL it displays. 2. The second way is to make the URL yourself. First, change the domain from http://www.amazon.com to http://amzn.com. Second, go to the page, and look in the URL for the code that starts with a B. Add that after the domain. Your short link will look like http://amzn.com/B0000000. From this, I get an amzn link for Dead Links: http://amzn.com/B009VPRCI8. Easy.